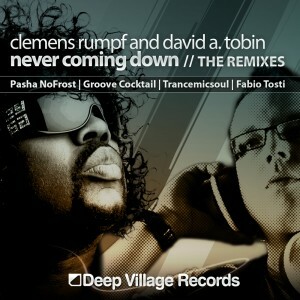 Deep Village Records presents the fantastic Never Coming Down Remixes from Clemens Rumpf and David A. Tobin. This is one of the hottest remix packages for all the house heads in autumn. The heavyweight mixes by top producers of the scene like Trance Micsoul (South Africa), Fabio Tosti (Italy), Pasha NoFrost (Russia) and Groove Cocktail (Poland) are guaranteed to get you on the dance floor! Whether it’s Pasha NoFrost and Groove Cocktail’s unbelievable funky soulful edits you desire, or Trance Micsouls and Fabio Tostis heavyweight Deep Edits you crave…they’re sure to give you the house music style you’re looking for. It’s a vibe thing, it’s a soul thing… it’s house. Remix and additional production by Groove Cocktail.